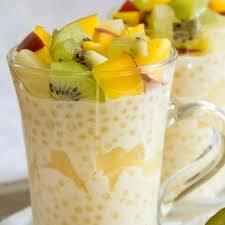 1 ½ cups baby pearl tapioca. (Let it soak in some of the water for at least a couple of hours so it will cook faster. Fruit—as much or as little as you want. Bring water and salt to a boil. Add tapioca. Cook until clear; keep stirring while it boils. Remove from heat and add Jell-O and sugar. Add fruit. We love tapioca at our house. What type of Jell-o is needed for this recipe? Is it unsweetened? Unflavored? I think its any flavor. I love tapioca, but I rarely make it. This sounds wonderful ! You could really vary this with different fruits and flavors.